The Wrestlemania 29 Command Center is no longer active. For more information on Command Centers, see our Social Business Page. The entrance music blares, an action-packed video appears on a big screen and a hulking athlete steps out onto a metal walkway. Thousands of fans go crazy and cheer or boo as their hero or villain makes his way down to a square ring, climbs through the ropes and gets ready to put on a show. There are few spectacles in sport that elicit the energy and fan dedication of professional wrestling. For many people, the drama, athleticism and, let’s face it, organized chaos of the WWE was a passion started in childhood that carried over into adolescence and still sparks their interest to this day. While a lot has changed in the WWE, two of its veterans will be facing off in the ring at this year’s WrestleMania, an annual event started in 1985 and the longest running event in professional wrestling. 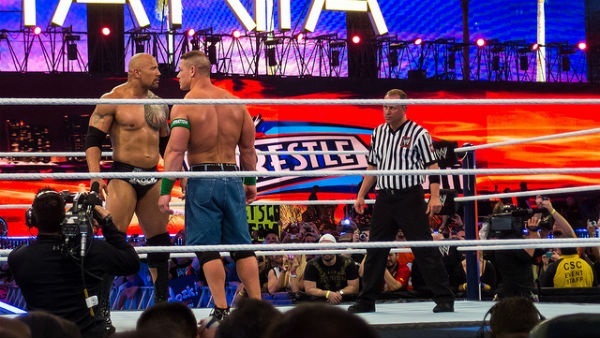 On April 7th Dwayne “the Rock” Johnson will take on John Cena at WrestleMania 29 and HootSuite is here to help fans participate, whether they’re in the stands or at home on the couch. Though WrestleMania is a one-day event, the wrestling world talks about it for weeks (if not months) before and after. That discussion now plays out extensively on social media channels, and we want all fans of wrestling to be able to take part. 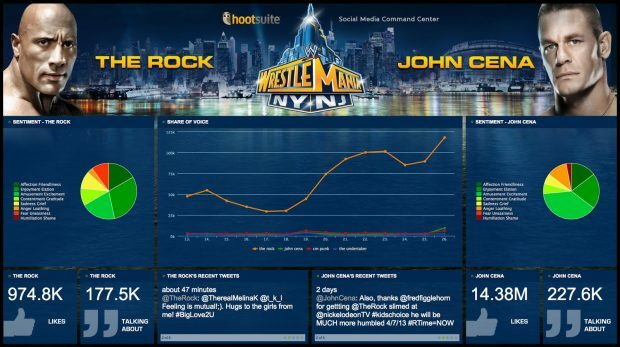 HootSuite has created a WrestleMania 29 Command Center to provide fans with another tool that will show them which wrestler is winning the social media game, no matter who is dishing out more punches and slams in the ring. We want fans to interact with one another and express their allegiances on social media, but also see what the majority is saying about Cena and the Rock. Together their tweets and Facebook posts could sway the social media tide in favour of one wrestler, bringing him the social media belt at WrestleMania 29. Every week HootSuite tracks the top international Twitter trends using What the Trend and most weeks the WWE is somewhere near the top. Wrestling fans are so active on social media that Monday Night Raw viewers make #Raw a top ten American trend once or twice a month. And it isn’t only the viewers that have adopted social media in force. John Cena is the third most followed American athlete on social media, with over 17 million combined Twitter and Facebook followers. The Rock isn’t too far behind, with over 12.5 million followers on the two social networks. The WWE is also a HootSuite Enterprise client. This organization has embraced social media like few others and utilizes these channels to provide fans with exclusive content and opportunities to interact directly with their favorite personalities. This year alone, the WWE is up for seven Shorty Awards, including Best Overall Brand Presence on Twitter, Best Overall Brand Presence on Facebook, Best use of a Hashtag on Twitter, Best Use of Social Media for Television, and Best Branded YouTube Channel. Partnering with the WWE, truly a model for social media use, is a great opportunity to demonstrate the real power of the HootSuite Command Center technology. This technology has already been used to compare the social media success of the Baltimore Ravens and the San Francisco 49ers leading up to Super Bowl XLVII, as well as President Barack Obama and Senator Mitt Romney during their 2012 election campaigns. So will you enter the social media ring for WrestleMania 29? Check out the Command Center now!